It’s great to see people taking more interest in caring for our environment. Believe it or not, office supplies and the office products you use can make a real difference in helping our planet. Everyone knows that reducing paper usage saves trees, and that businesses use a ton of paper products like copy paper, paper towels, and envelopes. Buying recycled office paper is a great start to doing your part for the environment, but there are many other ways to “go green” in your office. Before we even talk about buying recycled office supplies, first let’s talk about recycling in your office. If you are not already recycling in your business, start today. It’s easy, most employees want to participate as they already recycle at home, it helps save trees, and it keeps paper, glass, and plastics out of our landfills. 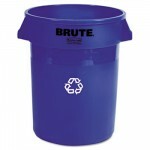 Use this Rubbermaid Recycling Canister for recycling large areas like break rooms and warehouses. The first thing to do is buy recycled bins to place in break rooms, copy rooms or by copy machines and desks. Recycled trash cans like the Rubbermaid RCP295573BE typically sell for under $9.00, and have the recycled seal so all know that only recycled materials go here. For larger needs in break rooms, try Rubbermaid Brute recycling containers – #RCP263273BE, and for convenient retrieval of cans, bottles and plastics, get the Ex-Cell 3 Compartment Recycling Container, (EXCRC15283RBL) which has convenient compartments for each item type. The second thing to do is make sure your office is recycling all the ink and toner cartridges you are using. With literally millions of cartridges being used every year, we are flooding our landfills with used ink jet and laser cartridges. The plastics they are made of have half-lives of hundreds of years, so they aren’t going away. Zuma Office Supply has a recycling program where they provide boxes to throw your used up ink cartridges, and then ship the boxes free to recycling centers to be reused or recycled. Click here to read more about this great program. Once your business is truly recycling, it’s time to start buying recycled products. The best place to start is by changing to recycled copy paper, which is by far the highest volume paper product used in offices. Yes, it costs a little more, but not that much more. Remember, people need to buy products made from recycled materials in order to use up all that paper being recycled, and copy paper does the most good. 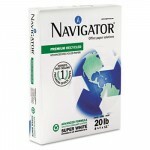 Zuma recommends Navigator Premium Recycled Paper which contains 75% recycled material with high 95 brightness. I recommend Navigator premium recycled paper which has a high brightness, and is great quality, (Item #SNANR1120). Some online office supplies stores like Zuma Office Supply feature this paper with very competitive pricing, and it contains 75% recycled material. Another great recycled paper brand is Great White paper by Hammermill. Their Great White 50 paper contains 50% recycled material. Next, go to your break room and switch out your paper items to recycled products. Let’s face it, businesses typically do not buy the softest most luxurious paper products for the office, so going to recycled will not even be noticed quality wise. Recycled paper towels and paper napkins are a “no brainer”, and Marcal has a great line that’s reasonably priced. Quality recycled paper plates are available from Chinet that are made from 100% recycled material and are compostable. SOLO cups has a new line called Bare PLA that are made from 92% renewable materials, and available in a variety of sizes. All these brands and items can be found at discount prices on ZumaOffice.com, and while typically a little more money than items that are not recycled, they are well worth the environmental impact in the long run. The truth is more people buying recycled products will cause prices to go down, which is good for our planet and good for you. Let’s all do good work together by actively protecting our environment, first by recycling in the office place, and second, by purchasing recycled paper products that are used in bulk in your business. It’s a part of practicing a conscious capitalism business model, which over time will bring significant positive social change to our world. This entry was posted in Recycling and Green Products and tagged conscious capitalism, Green Office Supplies, ink and toner recycling, Recycled copy paper, Recycled Office Supplies, Rubbermaid, Zuma. Bookmark the permalink. A trash can is quite necessary in the office to keep the clean environment. So true – but a recycled trash can reminds all those in the office to recycle their office paper and be kind to the envirnoment. Quite interesting, and I think that these days offices and the company are now recycling office supplies for the budget for sure and the most important is for the environment. The most important thing is the environment, and long term recycling and using recycled office supplies becomes better for the budget as well.